Malocclusion is the dental term for crooked teeth. When you consider all the different ways teeth can be aligned, it is not surprising that malocclusion manifests itself in numerous forms. At Koch Park Dental in Florissant, it’s a treatable condition. An overbite transpires when the upper front teeth come down too far over the lower teeth when the mouth is closed. An underbite is the reverse—the upper front teeth close farther back than the lower front teeth. An open bite refers to a bite in which the upper don’t overlap the lower teeth. This can occur on the whole bite or just one side. Tooth rotation is one of the most common types of malocclusion. Rotated teeth appear as if they are twisting out of place. Tooth rotation can create the illusion of uneven coloring because of the way light reflects off the face of teeth. Many people with crooked teeth are too self-conscious to smile, but aesthetics are not the only issue at play. Crooked teeth can increase the chance of tooth decay, tooth damage, and TMD temporomandibular joint (TMJ) disorder. Children with crooked teeth may have difficulty learning how to speak, and if they can’t chew meat and raw vegetables correctly, they may miss out on needed nutrients due to a limited diet. 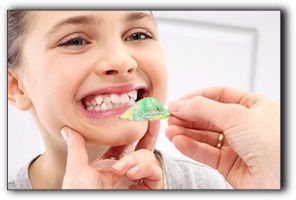 At Koch Park Dental in Florissant, we provide clear braces by Six Month Smiles and Invisalign. We also offer general dentistry. Schedule an appointment with us today.